At the start of the summer holidays, nine-year-old Frankie just wants to hang out with her best-friend-forever Billy Bloom, but boring Mr Grumble has given them a school project about what they want to be when they grow up. 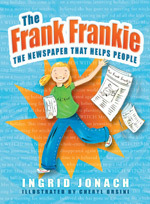 When Frankie meets a real life journalist, she decides to start her own newspaper. But a newspaper needs news, so soon Frankie is revealing her family secrets in print to every house in the neighbourhood! An engaging story about a delightfully energetic little girl with a passion for words. Every aspect of this book is fun, from the chapter titles to the line drawings that capture so perfectly the non-stop activity and the characters. I love a kids’ chapter book that aims so directly at its audience, you can hear the bulls-eye thud of its literary arrow. This book is very amusing and full of funny phrases and jokes… I think this is a very well written book. It is funny with a good storyline. I will recommend it to all of my friends so that they can enjoy it too. A perfect interpretation of a grade four girl’s life – two thumbs up!